NetEnt’s original Blood Suckers turns into a franchise with the launch of a brand new sequel. The Blood Suckers II slot tells the tale of Amilia, both vampire and vampire hunter, who returns to her ancestral home where her ancestors were slain. With a whopping TRP of 98%, lots of bonus features and splendid graphics, Blood Suckers II’s gripping story knows how to make you shiver at night. The original Blood Suckers slot machine was one of NetEnt’s crowning achievements. The game sets the bar for all vampire themed slot machine games. Now that a sequel has been developed, the Blood Suckers II slot machine is going to have its work cut out for it to top its predecessor. Can the Blood Suckers II slot trump its predecessor? It has got teeth, but is it better? Find out in our Blood Suckers II slot review. This is a slot machine game with teeth. Unlike its predecessor, which focused on famous vampires from fiction; the Blood Suckers II video slot has a story to follow. It tells the tale of Amilia, who is returning to her ancestral home, where her family and ancestors were slain by vampires. The catch? Amilia herself is a vampire, and a vampire hunter. The dark themed Blood Suckers 2 online slot is certainly going to lure you in with its gripping story. Graphically, the slot isn’t that much different from its predecessor. The same quality of graphics are present on the reels, and these include various vampires and medieval looking playing card suit symbols. Blood Suckers II is an inexpensive slot to play. There are 25 paylines spread over the Blood Suckers II game’s 5 reels, and although you cannot alter those lines, you can alter the amount you wager on them. Expect to find coin values adjustable and ranging from 0.01 up to 1.00. At the same time, players can wager up to 10 coins per line. Minimum and maximum bets are capped at 0.25 per spin, and 250.00 per spin, respectively. These kinds of wagers certainly won’t bleed you dry. But what can you win? The original game had an RTP rate of 96.94%, but the Blood Suckers 2 slot RTP is upwards of 98%, making wins frequent – very frequent. There is a non-progressive Blood Suckers II jackpot to be won, and it stands at around the 10,000-coin mark. It is yours if you can line up 5 wilds on a payline. There are enough boonus features for you to take a bite out of in this slot. The crest acts as the wild, and it can substitute for all other symbols save for the blood rose scatter icon. Wilds are also the best paying symbols in the slot machine game. Landing two or more of the blood rose scatter symbols on the reels will see you pocket scattered cash prizes, which a Blood Suckers II free spins bonus is triggered if you can land 3 or more on the reels. The free spins bonus is the first of two Blood Suckers II slot bonuses. 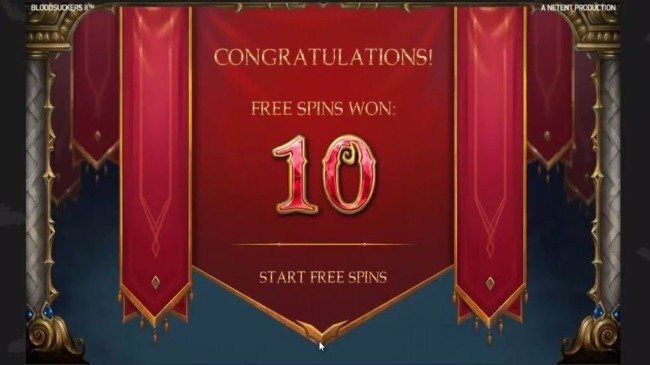 It offers 10 Blood Rose free spins. Players can bag 3x multipliers on all their wins in this feature, and they can retrigger it by landing 3 more scatters on the reels whilst the bonus is being played. At any point in the game, a Scatter Shot feature can trigger the bonus round with just a single scatter icon. Overlaying bonus symbols can appear on the first, second and third reels during this randomly triggered event. The second Blood Suckers II bonus game is a click and win feature. It is triggered if players land 3 or more of the double door bonus symbols anywhere on consecutive reels. 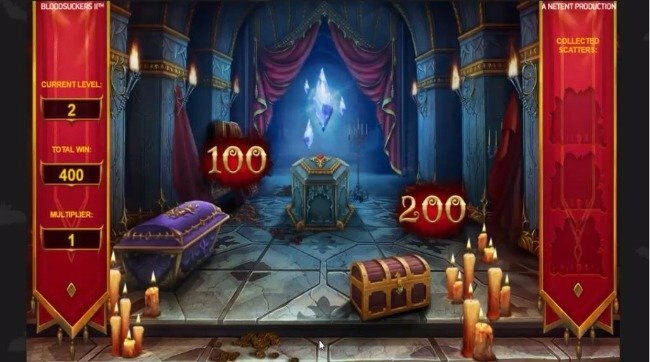 In the feature, players can choose from various caskets and chests on the reels to pocket coin cash prizes, key symbols, scatters or a demon. The demon ends the bonus, scatter symbols can trigger the Blood Rose free spins feature, which the key advances the player to a higher level, which offers better bonus prizes. The Blood Suckers II slot takes the Blood Suckers series in a wholly new direction and starts a terrific franchise for Net Entertainment. The game is slightly more complex than its predecessor, even though graphically it is on par. 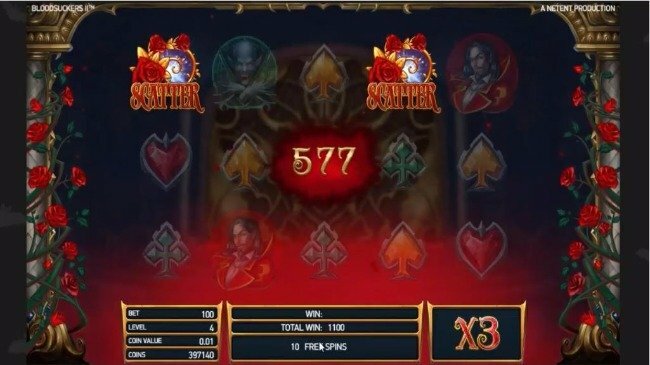 We’re not convinced that it will have the same impact as Blood Suckers, but it certainly continues the high quality of vampire-themed slots from Net Entertainment, and is miles ahead of other developers’ vampire themed slot competition.